“Six o’clock on the morning of July 4th found us on the road to Marsland, which was reached in an hour’s run; here a stop was made of over a half a day in honor of the nation’s birthday. Before leaving, rations for two days were received and distributed. From Marsland to Alliance a great variety of roads was encountered, sandy, steep hills, rough and untravelled, and a stretch of 20 miles of the best road we had yet traveled over. The route lay across a meadow leaving Marsland and across a large hill to a table land where the road was nearly level. We reached Hemingford at 4 o’clock and stopped a half hour. Leaving the latter place, a surprise awaited us—an actually good road, better than promised, and almost level. The corps was pleased and made an effort to break all previous records; everyone flew. At the end of the first 35 minutes nine miles were behind us and at 6 o’clock the entire corps was at Alliance on their camping grounds, having covered 20 miles at a rate of four and a half minutes for each. A party of twenty colored soldiers from Fort Missaula [sic], Mon., camped near Alliance last Saturday night. They were accompanied by Lieutenant Morse [sic], a medical officer, and an associated press reporter. 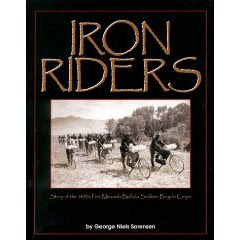 All were mounted upon bicycles, and each carried from forty to one hundred pounds, consisting of blankets, cooking utensils, guns, ammunition, half a tent, two days rations, repairs for the wheels, and all necessary and useful articles. 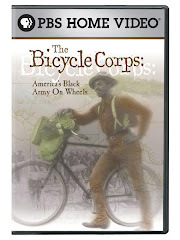 St. Louis is their destination and the long journey is being made as a practical test to demonstrate the value of the bicycle in military operations. They rode Spaulding wheels, and there were eight different kinds of tires in use. The average miles per day at the time they reached here was forty-four, about eighty-five miles being the greatest distance covered in a single day. They start early each morning, resting several hours in the middle of the day, and riding late in the evening. The result of the experiment so far is said to be highly pleasing to the military authorities, and is being watched with great interest by the public in general. Sir: - I have the honor to inform you the Bicycle Corps reached this place [Alliance] at 6:10 P.M. yesterday, and went into camp—total distance traveled, per cyclometers reaing, 938.8 miles. The bicycles are standing the test very well, and we have been troubled very little with our tires, having had only about six punctures since Fort Missoula. Up to this morning the general health of the Corps was excellent. At present, however, ten soldiers and myself are suffering from the effects of alkali water. The soldiers seem to be but slightly affected, and I do not anticipate any delay or trouble on their account. I was myself completely overcome and unable to continue the trip. I have turned the command over to the Asst. Surgeon, 1 Lt. James M. Kennedy, and will join it again tomorrow. Unless something now unforseen happens, we will reach St. Louis about July 20th. FIRST THOUSAND MILES – Good Run Made by the Regular Army Wheelmen ALLIANCE, Neb., July 7 – The Twenty-fifth Infantry bicycle corps pulled into this place during the evening. Although six hours were consumed during the day, a distance of 49 miles was covered. Roads for 30 miles were the best yet experienced. With favorable winds, one run of nine miles was made in 35 minutes. The first 1,000 miles have been completed leaving 900 miles to reach St. Louis. Alkali, or alkaline, water has a high concentratino of alkali and alkaline earth metal salts (Groups I and II on the periodic table), mostly comprised of sodium, potassium, magnesium and calcium. In Nebraska, there is a region known as the Alkaline Lakes. This region is labeled as 44b on this map http://www.protecttheflinthills.org/information/ksne_eco_map.pdf. Alkaline lakes are formed when the rainfall is not sufficient to cause the lakes to overflow into rivers. Rather, the water from a small region dissolves salts from the soil, runs off, and then collects in a lake, from where it evaporates, thereby steadily increasing the alkaline salt concentration in the remaining lake water. The lakes typically are very clear and inviting, since freshwater organisms don't grow well in it. Many people and livestock traveling through alkaline areas in Nebraska and the Southwest became sick and died from drinking these waters, which are also found as bogs and sometimes even in springs that have been drained faster than normal refill rates.